WHEN DOZENS OF people began to be informed for the first time that they were adopted, they were advised that a variety of supports would be given to them. In a move that broke with usual Tusla policy on the matter, the Department of Children said that everyone who’d been adopted but incorrectly registered as not being adopted would be told so. But despite the department saying that the HSE would be providing the necessary counselling needed, Tusla discovered that this wasn’t the case at all. The HSE said it’d either need to be given extra resources to provide it, or in other cases people would be facing a six-month wait to get the counselling they were assured they’d receive. Last May, Minister for Children Katherine Zappone revealed at least 126 children adopted from St Patrick’s Guild were incorrectly registered as the biological children of their adopted parents. 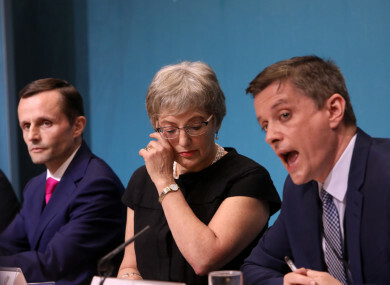 A senior HSE manager told Tusla in August that it had received no direction in relation to the provision of counselling services for those affected by the St Patrick’s Guild adoption scandal. A senior civil servant at the Department of Children said they were told by the Department of Health that the HSE would have been able to provide these services but “obviously the position has changed”, or things weren’t working as planned. Tusla has since had to fund a counsellor out of its own budget, despite asking the Department of Children for a further two more counsellors to be provided. Zappone said in May that all those affected would be notified of their illegal birth status but, prior to the issue being made public, fears had been raised that telling people affected may “do more harm than good”. In documents released to TheJournal.ie under the Freedom of Information Act, interim Tusla chief executive Pat Smyth wrote to the most senior civil servant at the Department of Children in October to say that this policy was in sharp contrast to how Tusla usually manages adoption cases. He said: “The records indicated that some people were aware of their birth status; however a significant amount had never sought any information and/or a search so it was presumed they had no knowledge. This decision to inform the 126 people affected contrasted significantly from the current Tusla’s tracing service, provided under Section 4 (k) of the Adoption Act 2010, where the service is delivered on foot of a tracing request from either an adoptee or birth family member. With this decision made to tell everyone affected their true birth status, Tusla set plans in place to provide the necessary supports. However, concerns were raised only a few months after the issue became public that the adequate counselling supports wouldn’t be in place for people who were being told for the very first time that they were adopted. On 3 August, the principal officer in the adoption policy unit at the Department of Children emailed the national manager of adoption for Tusla. The officer said that those affected by incorrect birth registrations could access the HSE’s National Counselling Service. “It is operated regionally, and as stated below, there are no waiting lists that we are aware of,” she said. The officer added that if anyone seeking the service had difficulty doing so, then Tusla should contact her again. She also forwarded an email from May confirming that the National Counselling Service would be made available to those affected. “Had contacted [...] on Friday last about the possibility of our cohort of incorrect birth registrations contacting the National Counselling Service,” she said. [...] from Mental Health DoH rang me back today. There is no difficulty with that, and he is not aware of any waiting lists for that service. On 10 August, the Tusla national manager emailed the Department of Children back and said the HSE had received no such direction to provide counselling to those affected by the adoption scandal. She wrote: “We have a number of people seeking this service. We contacted the HSE counselling service and they advised that they were not providing this service. There are two strands to the HSE counselling service, one that only deals with people who have experienced abuse and the other is the Primary Care HSE counselling services which we have used for some our clients in the past. One of my staff spoke to [...] the director of the Primary Care section and he advised that he had not received any direction in relation to these cases. He said that their service could do the work if directed, however they would need more resources to do so. In another area client[s] were told there was a six month waiting list. We need to get this sorted as soon as possible as one of our clients is considering making a formal complaint. Can you assist as a matter of urgency please? In response, the Department of Children official advised that this would be followed up, as it was their understanding HSE support would be available for those affected. “I had checked the Department of Health position in May, and obviously things have changed or are not working as intended,” the official said. In further correspondence from October, Tusla told the Department of Children that it was able to fund one post itself to provide counselling services, but asked if the department would be able to fund two more. In reply, the principal officer at the department asked to discuss that at a scheduled meeting as they needed to “get a sense of the demand there will be for this service”. Barnardos was enlisted by Tusla to provide these supports. “Tusla have identified that there is a need to make available a therapeutic support service for those adults whose births were incorrectly registered and are seeking support with this issue,” the agency said. Tusla also said that more intensive support would be provided on a needs-led basis and would include counselling related to incorrect birth registration. As of January 2019, only one of the three positions that Tusla said was needed in October is occupied. However, despite saying in October two more positions were needed, Tusla now says what it has is considered “sufficient”. TheJournal.ie asked the Department of Children about the situation in August regarding the HSE counselling service and also about Tusla’s request for more funding to provide counselling services. A spokesperson said: “Part of the support offered by Tusla social workers is a referral to Barnardos for counselling if the individual so wishes. Further to this, an experienced psychotherapist has been recruited for any long-term therapy requirements that the individuals may have and is expected to be in situ in the coming weeks. This position has been funded from within the Tusla budget. It is planned that this service will also be available through Skype for an individual who prefers the service delivered in this manner. The level of services currently offered is considered sufficient, however, the situation is being kept under review. TheJournal.ie asked Tusla about these two separate matters. Its response was almost identical to that given by the department. We also asked the Department of Health if it could clarify what the position it had taken regarding this matter. It said it couldn’t comment. Email “Six-month waitlist for counselling and confusion for those affected by adoption scandal despite promises”. Feedback on “Six-month waitlist for counselling and confusion for those affected by adoption scandal despite promises”.